Gamers hate lagging machines and distractions during the game session. It is common to find PC gamers stopping antiviruses when they play or avoid them altogether. There are various reasons why antivirus software can be annoying to a gamer. But when you buy the right antivirus, you will enjoy your online gaming experience while safeguarding the machine. Among the many annoying features of antivirus on a gamer’s PC include the resource-intensive processes when scanning the system which affects the graphics or causes the game to halt. To scanning process on some antivirus is obtrusive, making you have a bad gaming experience. In the extreme scenarios, the software can auto-restart the PC without warning, making you lose the progress of your game. Various companies develop antivirus software products. They all come with different features and services. The prices also vary from one product to another and from company to company. All these may lead to confusion to the end user who is looking for an ideal solution for their gaming computers. We know that gamers need to protect their systems with a high-quality antivirus. You need to guard personal files and online activities while gaming. But what is the best antivirus you can use to keep your gaming computer safe and on top performance? 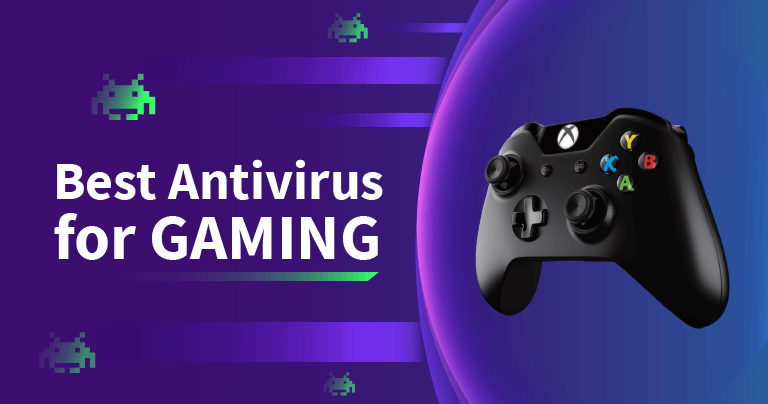 In this article, we take you through an antivirus software buying guide for your gaming laptop. The gamer’s mode is a system tool built into the antivirus software that helps you to quickly set up the antivirus to meet your gaming needs while still providing protection when you are playing online. The tool has setup options that prevent the app from causing obstructions when you are playing. 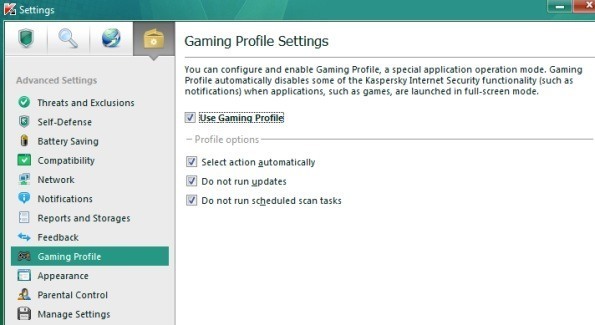 Activating the game mode (profile) on the Kaspersky Antivirus. The game mode of the antivirus also stops the app from rebooting your system after each scheduled scanning. 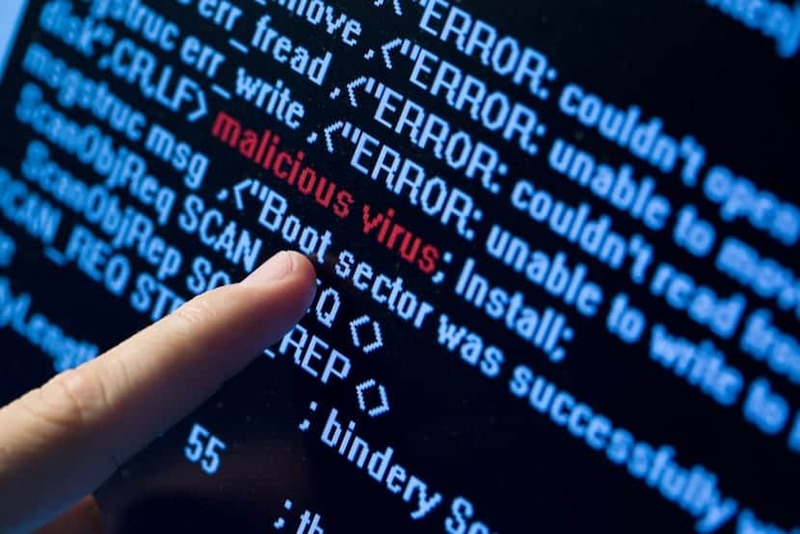 In this way, you can continue playing your favorite online games, and the machine reboots only when you exit the game mode on your antivirus. Some of the antivirus software for gamers can detect when you are through with computer games so they can ask your permission to reboot the system. When your gaming antivirus detects that you need lots of resources for playing online video games, the background scanning stops and reschedules for a later time when your PC is less busy. With this feature, you can continue with your game progress smoothly. However, the real-time protection is still active to prevent the accidental download of malware while you play. We all want to transfer our sessions on various devices. Online gaming is no different. Synching your game data on different devices makes playing feasible when you change places with different computers. You, therefore, need to protect all your devices against online invasion when playing. Some antivirus companies offer discounts when you buy a license for multiple devices. If you can find that allows you to use the same license for multiple computers without any extra cost, that will be your ideal option of gaming antivirus. Apart from licensing multiple devices, you need to consider your computer OS and the compatibility of the software. Some antivirus for gaming computers is only available for Windows PC. If you also have a gaming machine running Mac or Linux system, you might want to research further to get antivirus that will guarantee protection for all your systems. In case you do not come across one, you will be compelled to buy from different vendors for the OSes you run. Nobody wants to buy software that lacks support from the vendors. Any antivirus you buy for your online gaming computer should come with unparalleled technical support whenever the need arises. They will help you to set up the system to stay under real-time protection of the antivirus while your gaming continues. Not all the antivirus software have the simple “game mode” switch to help you activate the features you need on-the-fly. Some of the gaming mode features are accessible in various antivirus software, but you have to manually activate them. After you finish your online games, you can change your settings so that your PC and the antivirus may continue running normally. Notification suppression to avoid interruptions when in the middle of the game. Firewall protection even when playing online games. The feature helps to block loopholes hackers use to access the gamers’ computers. The ability to limit background processes to prevent the misuse of resources while playing online games. Auto-detection of full-screen mode. With this feature, the antivirus can detect when you are playing video games or watching online movies. It uses the feature to block unnecessary notification popups that could be obstructive. There are many options out there of antivirus with gaming mode. The best option depends on your preferences. Your budget may also determine what options you can choose from. If you have a tight budget, you might want to limit your online gaming to only one PC. We would also like to hear your opinion regarding this topic. What antivirus do you use for your gaming PC or laptop? What are the features that made you choose your current antivirus? Tell us in the comments section below. Previous articleTrade Cryptocurrencies With Minimum Risk By Buying Bit20! Next articleThe Future of Banking is Upon Us!